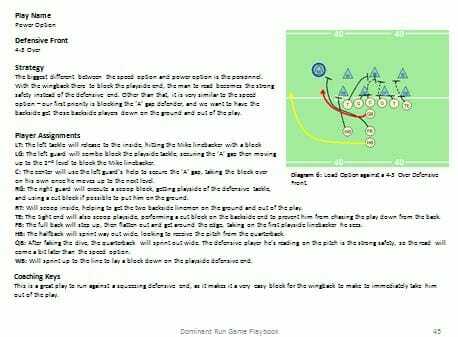 Here's The Secret To Developing An Explosive Rushing Attack, Dramatically Boosting Your Offensive Production And Dominating Your Opponents! The Running Game - it's the foundation of a successful offense, no matter what kind of personnel you're working with, how much experience your players have, or what system you're running. With so many teams using modern, pass-happy offenses, it's easy to forget the importance of the ground game. But the truth is, having an efficient and reliable rushing attack is now more important than ever! 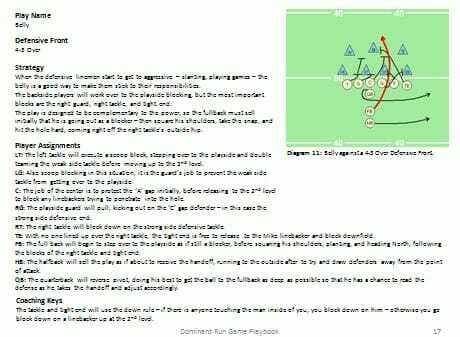 All laid out in plain English, with simple terminology anyone can understand (even if you're new to coaching). Here's a quick summary of what's included. The philosophy behind the Power Run is simple - overwhelm the defense at the point of attack, and use aggressive blocking techniques to clear the hole for your halfback. A fantastic complementary play. If you're a fan of old school football - a fullback on the field, and a between the tackles running game that opens the defense up to the playaction pass, the Belly should definitely be part of your arsenal. Overly aggressive defensive lineman? Make him pay by using the Trap! 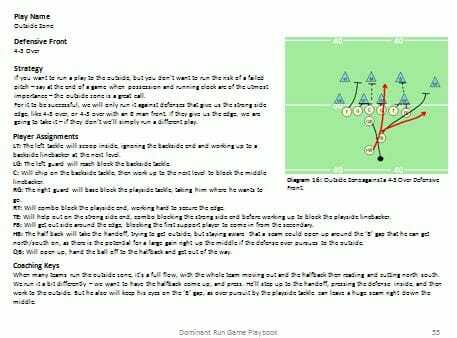 Not only does this play work great on it's own, it also forces the defensive line to play slower and more cautiously against every other running play you use. 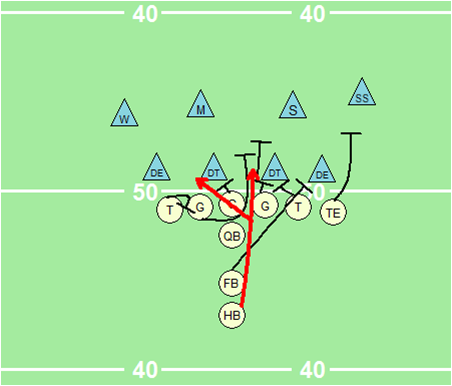 The Iso is one of the all-time best plays for youth football. It's simple to learn and easy to execute: blockers - block your man, running back - head straight downfield. 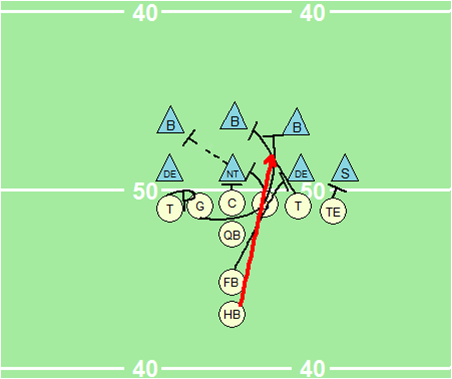 The Speed Option works by leaving the playside defensive end unblocked, and allowing the quarterback to read that defender after the snap. 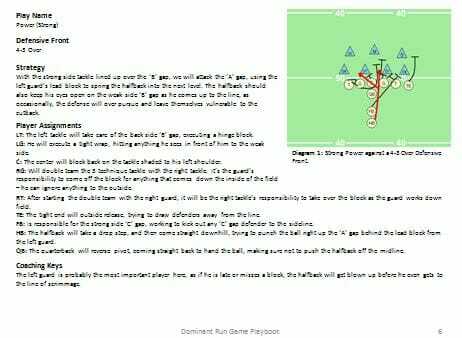 Run it outside or pitch to the halfback - it's almost unstoppable when run correctly. The Power Option is similar to the Speed Option, but with different personnel. 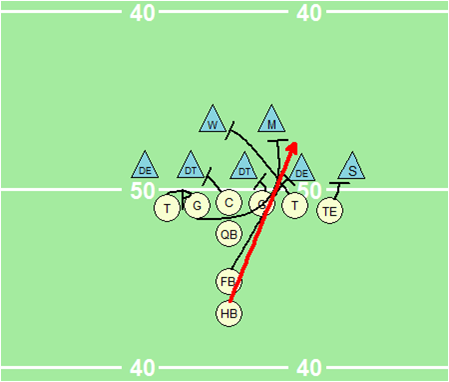 With a wingback there to block the playside defensive end, the man to read now becomes the strong safety. 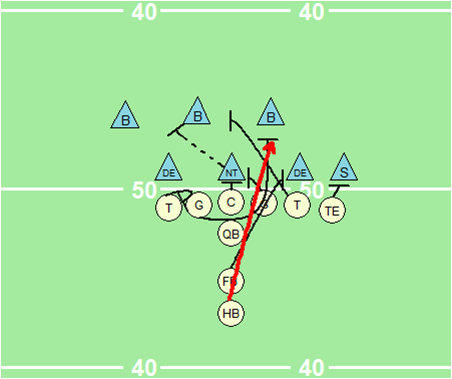 This is the option run that we recommend using on the tight end side. To execute it, you'll need to secure the edge with a zone combo block. If you want to run a play to the outside, but you don’t want to run the risk of a failed pitch, the outside zone is a great call. FACT: Most running plays fail because one or more players didn't know their assignment! 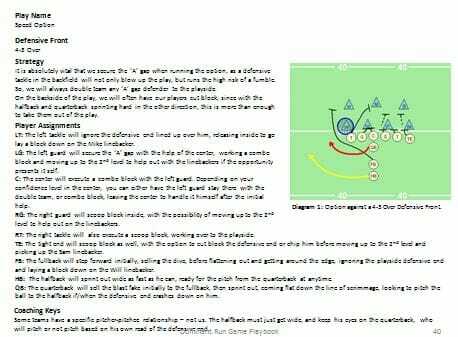 With the Dominant Running Game Playbook, you'll see exactly how to adjust your blocking scheme for the most common defensive fronts. So you can execute your run plays to perfection, no matter what defensive scheme you're facing. This playbook is guaranteed to boost your offensive production and help your team win more games. If you're not happy for any reason - or no reason at all - just contact us and we'll give you a fast, full and cheerful refund. That's how confident we are that this will work for you. No matter what your team looks like, or how much you're struggling right now. 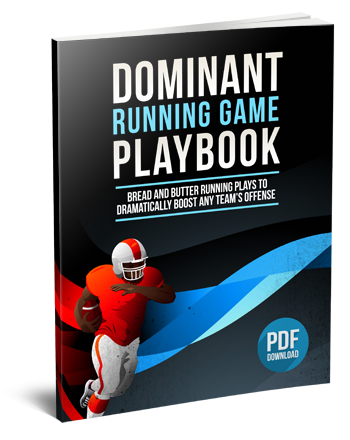 Order The Dominant Running Game Playbook Now! The regular price of this playbook is $47. But if you're one of the first 500 coaches to download a copy, you can get it for just $47 $27 $9. That's an 81% discount! ... all for just $47 $27 $9. Click the Add to Cart button now for INSTANT ACCESS! 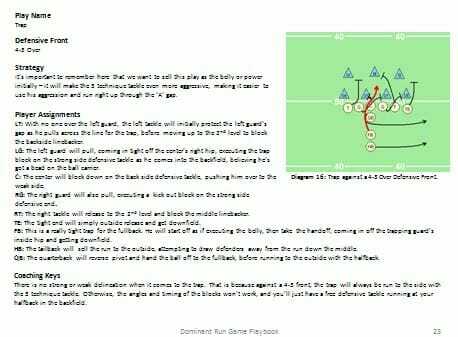 The Dominant Running Game Playbook lays out 8 “bread and butter” plays that work for all ages and competitive levels. Each one is explained with step by step diagrams and clear instructions, so they’re easy to install and easy to implement. The playbook is covered by a 60 day, no questions asked money back guarantee. If you’re not happy for any reason (or no reason at all), just contact us and you’ll get a fast, full, and cheerful refund. Will this work with my current offensive scheme? 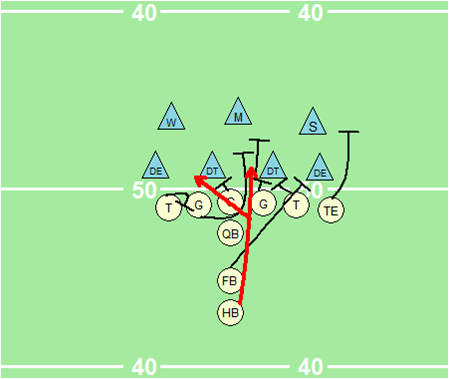 The plays are designed to work with any offensive philosophy, and can be used “as-is” or easily customized for the scheme you are running right now. What type of personnel do I need? The playbook includes a variety of plays that will allow you to pick and choose from, depending on the type of athletes you have in the backfield, and the strength of your offensive line. 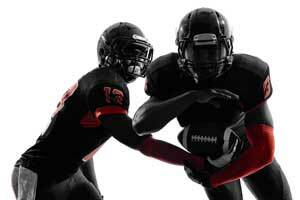 If you can’t find plays that work for you and your team, we’ll give you a full refund. No questions asked.